On the rare occasion Jackie Lindsey goes outside, she wears a full silver suit complete with a veil to hide her entire body and face. 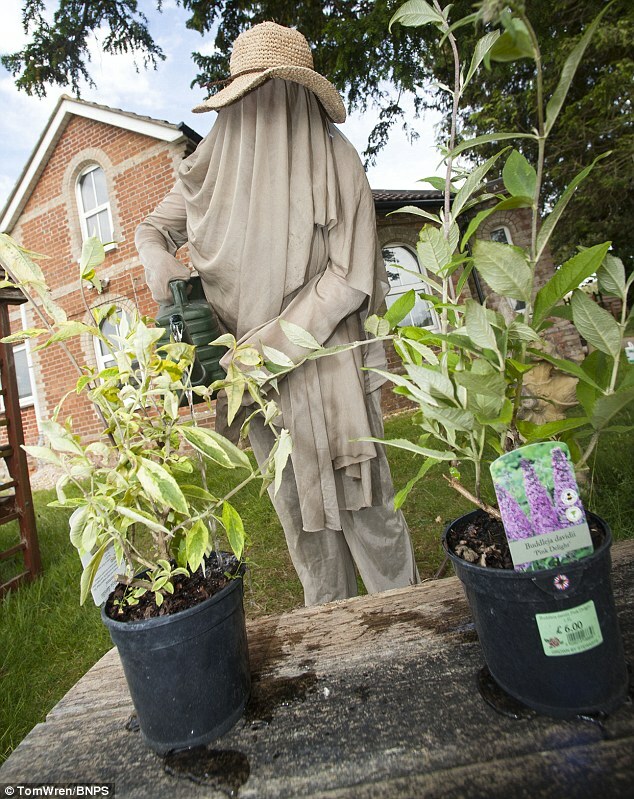 Neighbours have said the 50-year-old’s outfit makes her look like a ‘demented bee keeper’. 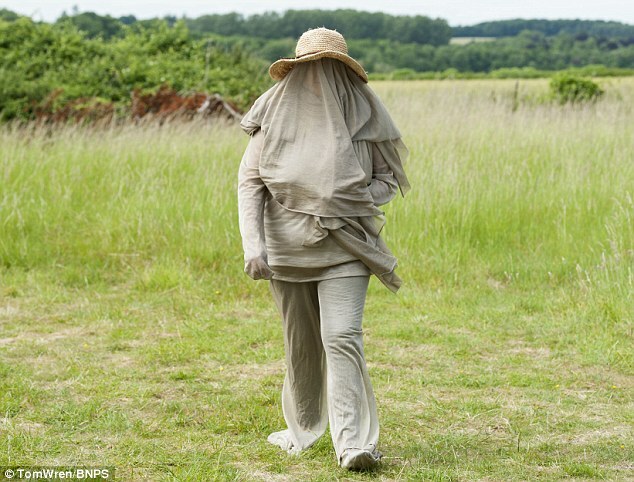 But rather than tending to a hive, Ms Lindsey, 50, claims she needs the suit as she is allergic to electricity. She has diagnosed herself with electromagnetic hypersensitivity (EHS), and says anyone using Wi-Fi or a mobile phone signal around her could cause her to have an attack similar to an anaphylactic shock. This is an extreme, often life-threatening allergic reaction. As a result, she has ditched all electrical products in her life, turned off the power in her home and uses candles for light and gas for heating and cooking. The suit she wears to venture outside has silver woven into the fabric to reflect the magnetic fields around her. And she also uses an electromagnetic field testing device (EMF) to measure the magnetic current in the air, when out in public. Ms Lindsey led a normal life as a rental landlord until eight years ago when she started suffering neurological symptoms - dizzy spells, shooting pains in her eyes and numbness in her hands - but no medical explanation could be found. She started doing her own research and after three years of not knowing what was wrong she discovered EHS. The condition is not yet recognised by the medical profession in the UK but it is regarded as a disability in Sweden. According to the charity ES UK, four per cent of the population now suffer from the condition and the figure is likely to rise due to society becoming ever reliable on modern technology. Ms Lindsey now lives like a recluse in a rural location in Wimborne, Dorset, after being forced to sell her old semi-detached house because she could feel her neighbour's electricity. She carries the EMF tester with her to check her surroundings if she feels unwell or in pain. On a good day she can run into a shop for five minutes without being too badly affected by things like fluorescent lighting and checkout scanning devices but most of the time she relies on deliveries or family bringing her shopping. She said: 'I was relieved when my research brought up the disorder of EHS because it made sense with the symptoms I had been suffering on and off for years. 'But it's difficult to be taken seriously. Lots of sufferers lose friends and family because they can't understand it and think the person has gone mad. 'I do feel insulted by GPs when they tell you it's in your head. 'It's not that long ago that the medical profession told people with ME it was all in their heads. 'I've lost everything in life that makes you feel human.
' I can't go on holiday and feel sad at Christmas and festive times when I want to join in but can't. 'I have to live by gas which means waiting 12 hours to get hot water and using candles to light the place. 'I wear the suit whenever I leave the house, it has 20 per cent silver woven into the fabric which reflects the magnetic field. It doesn't give that much protection but it allows me to be out a bit longer. 'When I wear it people usually treat me like I'm highly contagious, but I'm past caring. One person described it as a demented beekeeper suit, I thought that was quite right. 'If it means I can sit in a pub garden, have a glass of wine and feel human again then I don't care if people avoid me or look me up and down. 'The main thing is knowing what to look out for, when I moved I avoided areas with phone masts, street lamps and power cables. Sarah Dacre, trustee of ES UK which helps people who have become sensitive to everyday electrical appliances, said: 'The symptoms of EHS are becoming increasingly common. 'Four per cent of the population are severely affected by the condition while 30 to 40 per cent are mildly affected. 'There are a range of symptoms but the most common are headaches during the day when using technology, vertigo, sleeplessness, digestive intolerance, rashes and an irregular heartbeat. 'In some cases, sufferers can feel the effects of someone using a smartphone for 40ft away that might even result in collapse. 'It is a similar reaction to an anaphylactic shock. WHAT IS SENSITIVITY TO ELECTROMAGNETIC WAVES? Up to four per cent of the general population believe themselves to be affected by electro- or radiosensitivity and experience flu-like symptoms, headaches, lethargy and nausea when exposed to various electrical appliances. Many medics are sceptical about electromagnetic hypersensitivity syndrome and research has not provided any official statistics. The condition is not officially recognised by the NHS. Electromagnetic waves are everywhere and we are constantly bombarded by them from space. Although there is no evidence of any permanent damage to the body from electromagnetic waves, some people have reported that they feel unwell when they are within reach of Wi-Fi or, occasionally, other types of electromagnetism. Wi-Fi uses the same type as mobile phones, TV and radio signals. They are all different in wavelength, so have different properties. Wi-Fi waves are higher in frequency than mobile phones and are intense due to the amount of info they carry. So far research has not provided any official statistics.